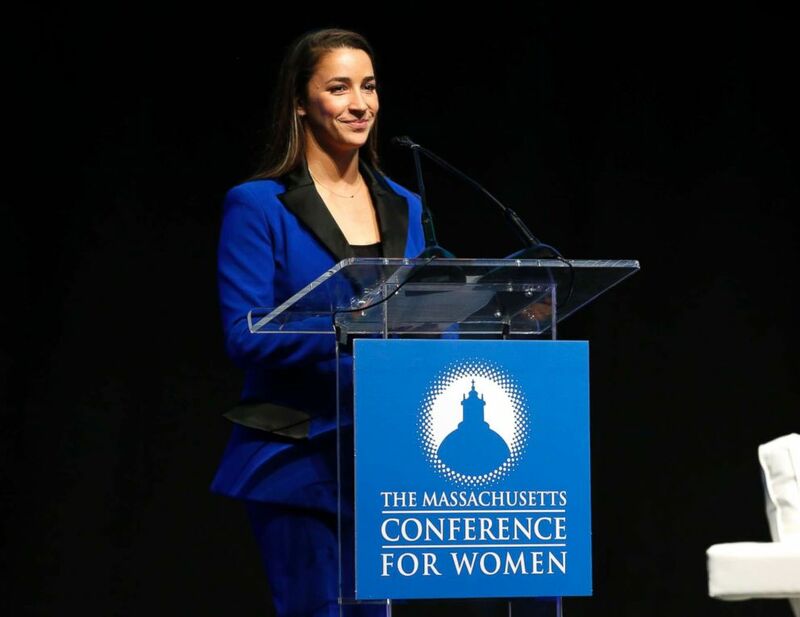 Raisman, 24, spoke at the Massachusetts Conference for Women. Olympic gold medal gymnast Aly Raisman said she's a new definition of strength after becoming an advocate over the last year for survivors of sexual abuse. "When I was training, strength to me was about being mentally strong ... and you obviously have to be very physically strong as well," Raisman said. "I also think being strong is also having the courage to let yourself be tired and admit to yourself that you might need to take a break or that it's OK to not be OK."
She went on: "As an athlete where you're kind of trained to be very serious and you don't want to show the judges that you're nervous or that you didn’t have a good warm up, you just want to have that good poker face on all the time. That was sort of new for me, learning, just to say, 'I'm so exhausted and I have to take care of myself today.'" (Marla Aufmuth/WireImage via Getty Images) Captain of the gold medal-winning U.S. Olympic women's gymnastics teams in 2012 and 2016 Aly Raisman speaks during 2018 Massachusetts Conference For Women in Boston, Dec. 5, 2018. 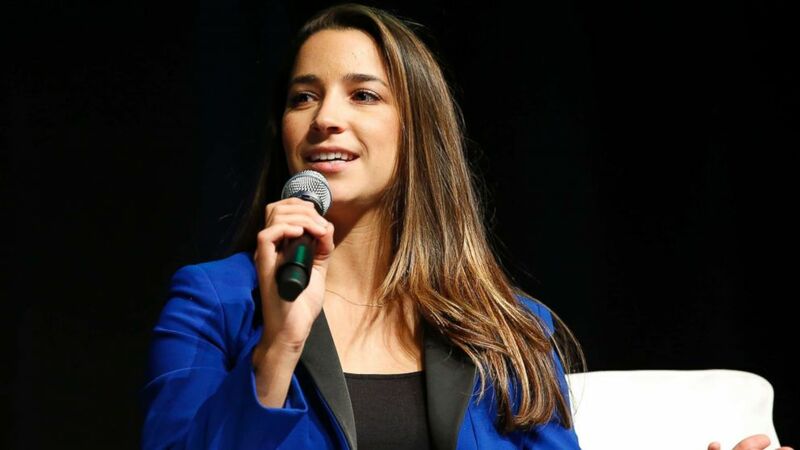 Raisman, 24, spoke about her experience Wednesday before thousands of women at the annual Massachusetts Conference for Women, the largest women's conference in the United States. The Massachusetts native won multiple gold medals competing in the 2012 and 2016 Olympics, but most of her remarks at the conference focused on the role she's stepped into over the past year as an advocate for sexual abuse survivors like herself. Raisman was one of the dozens of gymnasts who spoke out about the rampant sexual abuse by disgraced doctor Larry Nassar, who was sentenced in January to up to 175 years in prison. "You cannot silence the strong forever," one said. Former Olympian Tasha Schwikert told her story for the first time to ABC News. Aly Raisman joined Simone Biles in publicly criticizing the former politician. Just before the sentencing, Raisman faced Nassar in a Michigan courtroom and told him, in a speech that went viral, "The tables have turned, Larry. We are here, we have our voices, and we are not going anywhere." 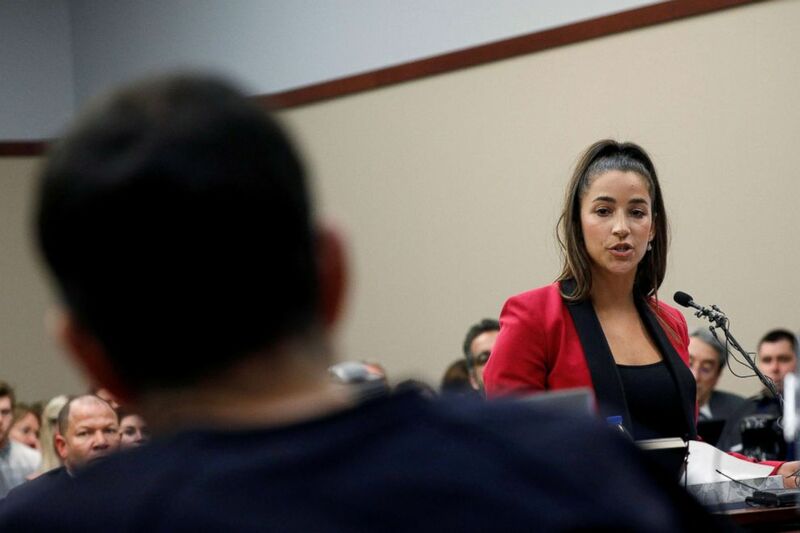 (Brendan McDermid/Reuters) Olympic gold medalist Aly Raisman speaks at the sentencing hearing for Larry Nassar in Lansing, Mich., Jan. 19, 2018. Since that day, Raisman has been on a mission to remove the silence that has surrounded sexual abuse victims. She has delivered countless speeches, met with other survivors, accepted the Arthur Ashe Courage Award at the 2018 ESPYs with 140 other survivors and launched a campaign, Flip the Switch, for which she personally signs the certificates of people who complete the campaign's online courses on how to spot signs of sexual abuse. The advocacy work has not come easy for Raisman, who started in gymnastics at age 2. "In the last year, just from speaking up, there were plenty of times when I was just so exhausted I didn't have the energy to work out, and I would feel like I'd just run miles and miles and even just walking up the stairs was exhausting for me," she said. "I would say that even just speaking up, I felt like I had just done this crazy hard workout because it took so much from me." Raisman, who also described getting headaches after giving speeches, said she's learned to meditate daily, still sees a therapist and recently took up gardening to help her relax. "I understand that talking about sexual abuse is uncomfortable. I wish I could talk about gardening up here all the time," she said. "It's very hard for me." "It's very, very confusing and very scary, and sometimes it can get worse before it gets better," Raisman said of speaking out about sexual abuse. Raisman has continued to speak out about abuse in gymnastics since Nassar's sentencing. She called for an independent investigation of the USOC and USA Gymnastics by federal authorities, and then, in March, filed a lawsuit against USOC and USA Gymnastics. Raisman also used her voice to call for the ouster of Mary Bono as interim president of USA Gymnastics because of Bono's association with a law firm that advised USA Gymnastics during the Nassar scandal. Bono resigned as interim president and CEO of USA Gymnastics in October after four days, according to ESPN. Earlier this week, USA gymnastics filed for bankruptcy in the wake of lawsuits over the serial sexual abuse perpetrated by Nassar. "It was very frustrating and it still is so frustrating that they, that USA Gymnastics, still treats me and my teammates like we are adversaries when we're saying that we were abused while we were training," Raisman said Wednesday. "It's crazy to me that we live in a world where so often survivors are treated like adversaries when they're brave enough to tell their stories." Raisman also described what prompted her to speak out publicly. "I was very nervous and very scared," she said, "but I knew that I couldn't sit back and watch organizations continue to sweep it under the rug and act like nothing was happening."